Contributors: Jamas Enright, Jeff Stone, David Ronayne, Teri Ronayne, Alex McCunn, Leigh Hendry, Robert Fleming, Bill Geradts, Paul Scoones. from The Children's Annual Collection Guide (1988), by A Clark. from On This Day: The History of the World in 366 Days. She'd read his name on his convention badge, but still she'd given him an unpleasant shock. At least, taking his cue from some of the badges he'd noticed, he wasn't displaying his surname. 'Afraid so,' he said as unwelcomingly as he could. This item appeared in the NZ Herald, 10 November 1993. 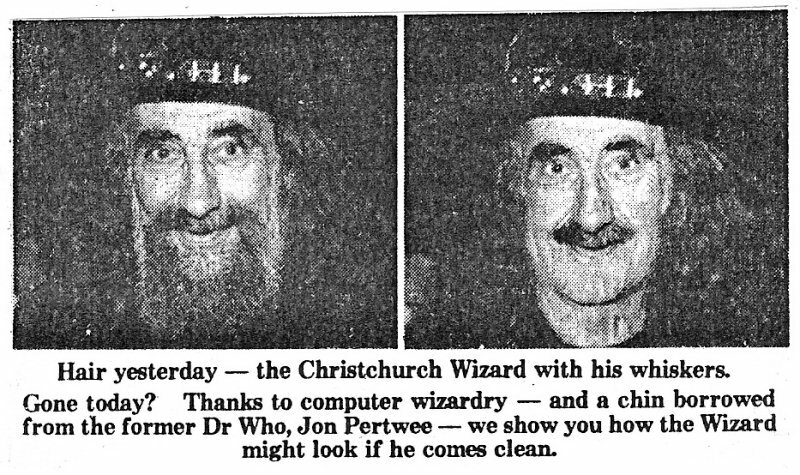 The Wizard of Christchurch and Jon Pertwee were both guests at WhoCon 1990, though the two never actually met during the convention. Q: What was the warcry of Dr Who's great enemies, the Daleks? Brian giggled. "Whosing the What? How'd you say that, goo-erks or what?" 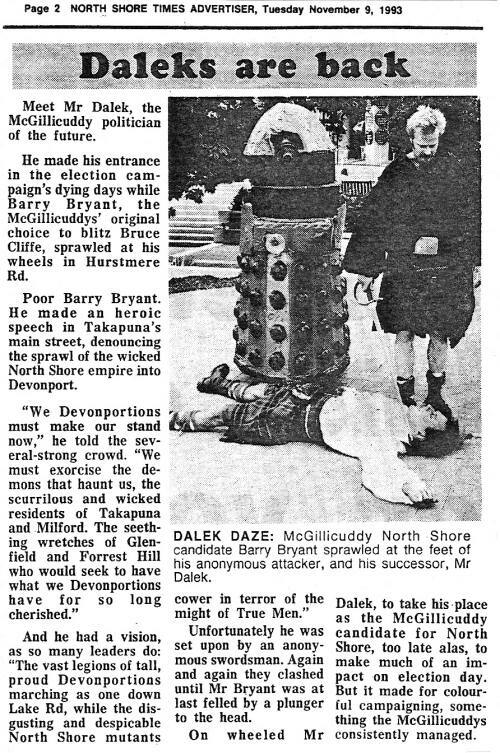 "Oh, go ask a Dalek -"
From North Shore Times Advertiser, an Auckland suburban newspaper, Tuesday 9 November 1993. Whose Line is it Anyway?, an improvisational TV game show, broadcast on NZ TV on Friday 4 September 1993 had a game of 'props' where two contestants team up, are given a prop and have to improvise a short scene using that prop. 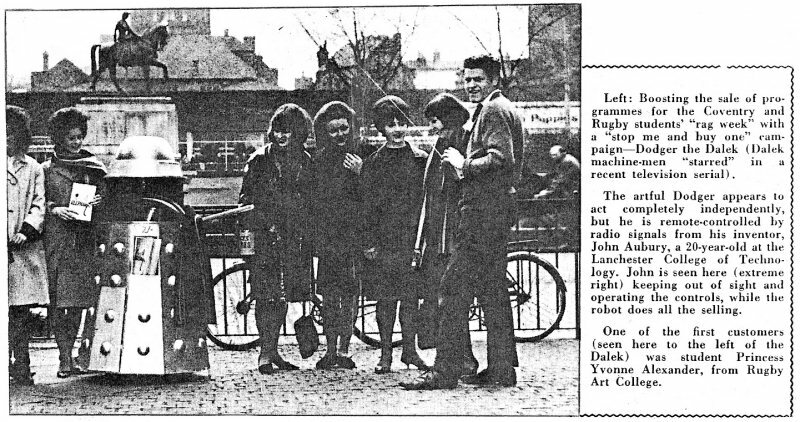 Tony Slatterly and Ryan Stiles were teamed up and given a rubber flipper. In their first scene, Tony holds the flipper to his chest and says 'It is a cheap episode of Doctor Who, and I am one of the flipper people,' then waves the flipper. The Martin Henderson award for fine sartorial splendour - Ritchie Watson, for the cute ensemble sported by Our Leader at the NZUSA conference - brown vinyl jacket, pink scarf and yellow gloves. Paula Ryan faints in delight and Doctor Who fans cue up to vote for Ritchie. Excerpts from Creepy Comix, published in Big Comic Fortnightly No.107, 4-17 July 1992.